Mushkin presents the Chronos and Chronos Deluxe, new solid state disks with SandForce's latest SF-2281 controller. Both models offer a SATA 6Gbps interface, the 120GB Chronos Deluxe models promise read speeds of up to 560MB/s, write speeds as high as 520MB/s and 90,000 random 4k IOPS, while the 240GB version promises an additional 10MB/s for the write speed. The performance of the regular Chronos drives will be lower, as these disks use cheaper NAND flash memory. 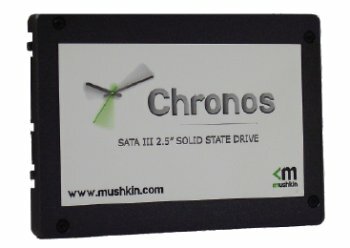 Mushkin, Inc., a global leader in high-performance computer products, today announced "Chronos", a new solid state drive series based on the SandForce SF-2281 processor. This series will be Mushkin's first utilizing the SATA Revision 3.0 protocol, providing 6 gigabits per second of bandwidth. The Chronos Series is comprised of two types of products: "Chronos" and "Chronos Deluxe". Chronos Deluxe SSDs utilize high-speed NAND flash memory and are ideal for enthusiasts or those in audio/video production who require the greatest possible bandwidth. Chronos SSDs offer asynchronous flash memory and provide users with eye-opening SSD speed and functionality at a value-oriented price. "This new series of SSDs is the latest in Mushkin's long history of solid state storage products. This is an area in which we have made great strides and our Chronos SSD line will continue this tradition. Users who are ready for SATA 6 Gb/s now, or are planning to upgrade down the road, will not find a better drive in terms of performance and price." – Brian Flood, Mushkin director of product development. SandForce, Inc., developer of the controller used in all Chronos SSDs, states the following: "SandForce is pleased that Mushkin has chosen to introduce their next generation SSDs with the latest SandForce SSD Processors," said Jeremy Werner, director of marketing at SandForce. "Their end customers will greatly benefit from the enhanced user experience with the breakthrough performance of the SF-2281 utilizing the new 6 Gbps SATA 3.0 interface." The Chronos SSD series are blazing fast drives with up to 560MB/s read and 530MB/s write throughput. IOPS will measure up to an astounding 90,000 with 4K random write transfers. Reliability and maintenance features include the SandForce DuraWrite, RAISE (Redundant Array of Independent Silicon Elements), Recycler (Garbage Collection), Intelligent Wear Leveling, Read Disturb technologies and Enhanced ECC using BCH and up to 55 bits per 512 byte sector. These additional SSD optimizations ensure that Chronos SSDs are the most comprehensive and reliable SSDs available. Chronos Series SSDs cover the range of price and performance better than any previously released technology. With something to offer for both the most demanding applications as well as a high-performance value solution, Chronos SSDs help people get more from their computer. Availability is expected later in June 2011.